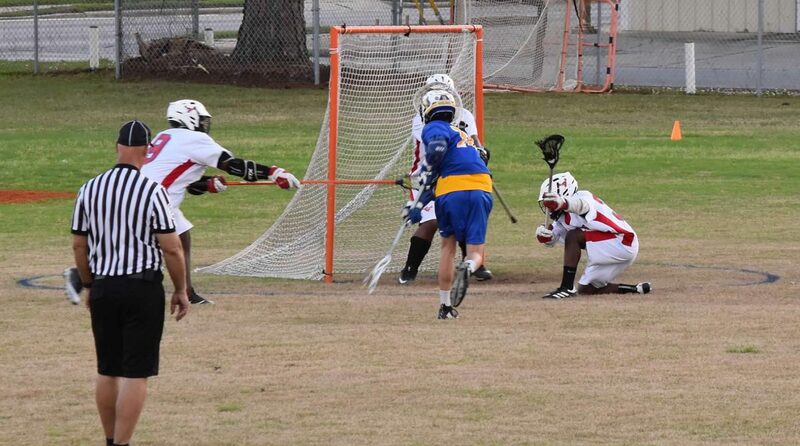 Sophomore Attackman Paxton Ballard takes a shot during the away game on Saturday, Feb. 25, against the Pascagoula Panthers, running up the shutout that ended 24-0. (PASCGOULA, Miss.) The Wolves overpowered the Pascagoula Panthers in their win on a cool Saturday afternoon (Feb. 25), crushing the home team by a scoreline of 24-0. Both sides of the field played to the best of their abilities to prevent the Panthers from scoring a single goal, while scoring early and often against them. The Wolves came out firing in the first quarter, going up 7-0 while Pascagoula struggled to start the game. The second quarter was more of the same for the Wolves, as they added another seven goals to finish the quarter 14-0. The Panthers continued their play from the first quarter, not doing much to trouble the Wolves’ defense. In the third quarter, the Wolves focused their efforts on scoring goals that relied on teamwork and ball movement, as opposed to scoring by solo goals, and finished the quarter with another six goals and a score of 20-0. The Wolves finished strong in the fourth quarter; they controlled the pace of the game until the last minute and contributed four more goals to their total score count of 24-0. Every aspect of the game was dominated by the Wolves as they were simply too much for the Panthers to handle. The offense was able to score at will, and scored goals of all varieties. The defense wasn’t really tested with the Panthers having few offensive possessions. But when called upon, the defense stepped up and quickly snuffed out any would-be scoring chances. The Wolves continue their winning streak with a 4-0 record and start preparing for their next opponent, the St. Thomas More Cougars, who will offer the Wolves the biggest challenge yet in their season. The Wolves play Saturday, March 3, at St. Thomas More Stadium in Lafayette, Louisiana, at 4 p.m.